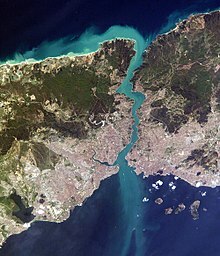 Satellite image of the Bosphorus strait, taken from the ISS in April 2004. Aerial view of the Bosphorus strait from north (bottom) to south (top), with the city center of Istanbul at the southern end. This page was last edited on १५ अक्टोबर २०१७, at ०८:१३.